Following the public hearing organized by the Port of Los Angeles (POLA) nearly two weeks ago regarding the proposed Southern California International Gateway (SCIG) railyard by BNSF, Long Beach Councilmember James Johnson has decided to take matters into his own hands–literally. 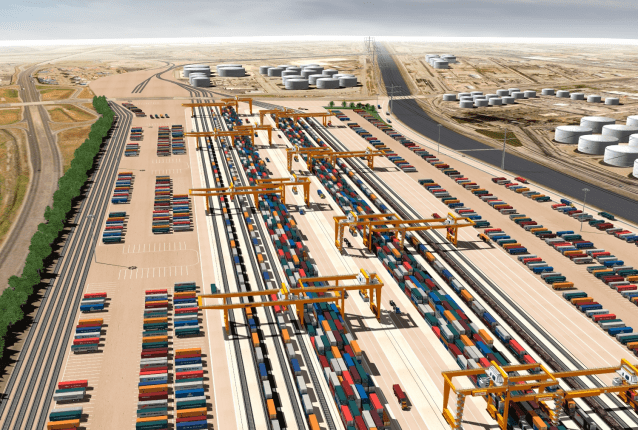 The SCIG Railyard is a proposed 12-track rail yard intended to expand the Port’s capacity for goods movement. The 153 acres are already mostly owned by the Port in unincorporated East Wilmington. Residents of West Long Beach fear the impact such a yard would have on local air quality and road conditions as trucks and trains access, idle and leave the port area. The project would cost $500 million dollars. After a rare show of vitriol towards the POLA after the port refused to hold a public hearing in West Long Beach Johnson has decided to host his own public hearing . While POLA opted for Wilmington for its hearing, Johnson will host his in West Long Beach, the region he represents and the one POLA’s documents show will be most impacted by the rail yard. By holding a hearing Johnson is not just giving residents a chance to speak up, but also gets their opinions on record. The move, at least within the eyes of detractors of the project as it stands, was a bold move to be both applauded and respected. “A core part of the democratic process is the right of residents to be heard on projects that may affect them,” said Johnson, who also said that the recorded responses will be transcribed and sent to POLA as a formal response to the matter. The project, particularly following the analysis of its RDEIR, has gained more media attention within the past two weeks than it has over the past five years, including a rather ironic piece from the Press-Telegram covering the initial public hearing after endorsing the project just weeks beforehand. The surge in coverage is most likely due to BNSF’s rather faulty response that residents within the proposed construction area will suffer more if the project does not go ahead as planned. Johnson’s own hearing will be held next Wednesday, November 7, at Silverado Park at 6 pm. Silverado Park is located at 32nd Street and Santa Fe Avenue. Can’t get in the way of progress, it seems like the positive part of this is that it will take many trucks off the 710. Correct? Yeah, the ports and associated industry are a major part of the LA economy, and they have been trying to do a lot to improve their position. Alameda Corridor/ACE, initiatives to reduce truck & ship emissions, etc. And this would be a major investment by a private entity (BNSF), in expanding rail capacity. I’m going to guess that you are not a resident of Wilmington. Is that correct? I think you’d be singing a different tune if you were. Do these trucks from the 7-10 disappear or use other facilities? How does a project that is ultimately intended to expand the port’s capacity for goods lead to a reduction in trucks? I suggest reading a prior post on this blog about the SCIG. It’s building a railyard so trucks dont have to drive to the other railyard off the 710 freeway. So yes it sounds like it will reduce trucks driving and dropping off goods at a different railyard not near the port. The forest for the trees here, omitted by folks like TripleCrown, is that logistics is a well paying source of blue collar jobs, and is heavily dominated by lower education and non-White ethnic groups. These are jobs that just as easily could move to the other side of the border to Lazaro Cardenas, or be shipped through the Panama Canal and burn more barrels of greenhouse gas emitting, dirty bunker fuel. John Husing made a great presentation to SCAG here at http://www.scag.ca.gov/committees/pdf/rtpscssub/GoodsMovementSub102912.pdf on how important goods movement and logistics is to the region, and globally by making these deliveries competitive right here in California, instead of emitting more global pollution, paying less, and damaging communities more if the work was done in Mexico or in the Southern United States. The BNSF’s Southern California International Gateway is a “near dock” container transfer facility that, while well-intentioned, is sorely lacking. It still uses trucks to move a small portion of port container traffic between the ports and its new railyard, and it will not mollify LA residents outraged at seeing yet more pollution and congestion imposed on their communities in the name of globalization. There must be a better way, a more imaginative way, and there is: GRID, which you can study here. GRID is the only project that supports shipping without oppressing the communities of Eastern LA county, and deserves serious consideration. I’m a resident of San Pedro, so I write this as someone intimately familiar with the Port’s impact on surrounding communities. While the SCIG itself might take some trucks off of the 710 it does little to reduce the pollution generated at the port. In fact, it may even make it worse/more concentrated because those trucks will spend more time at low speeds in stop-and-go conditions (where pollution is elevated) in the port cities area. This means more air pollution for San Pedro, Wilmington and Long Beach. Those aren’t all electric trucks, trains and cranes, are they? What sounds like progress from a high-level view is really no more than doing the same old thing we’ve always done – ships to cranes to trucks to trains. All this shuffling is inefficient, and locating the SCIG “near” the port while still needing to expand the 710 says that it’s not going to solve our freight movement problems. To maintain competitiveness with other US and Mexican ports now that the Panama Canal is being widened and the post-Panamax freighters can reach the East Coast directly we have to think differently and far more efficiently – the current scheme of container movement hasn’t changed architecturally since the 1960s. There is no technological reason we can’t unload containers directly to trains, removing trucks from the equation altogether (trains are far more efficient at goods movement than trucks). There is also no reason that those trains can’t be electric. I think that we really need an alternative which is more forward-thinking: one that makes a quantum leap, not a baby step forward, and do so while being not just environmentally responsible but beneficial. Over the past few years I’ve read a lot about the GRID proposal, and the more I know about it the more it seems to accomplish all of these objectives. So, POLA and POLB, it’s time to think outside the container you’ve been living in. Calwatch: I didn’t obscure a part of the equation. I’m suggesting that despite the potential for local benefits, many in the community such as a post above, have determined that their environment, community, and quality of life benefit little from this project that will have immense localized costs. And this isn’t just about the SCIG, it is about the local community disproportionately bearing the brunt of these project impacts. People have spoken up against the patterns of development down there repeatedly, but I guess they should be ok with it since a similar demographic may work there. So the proponents of this project should just stand in front of the community and say hey, this is great… you know the people who work in these types of jobs are just like you. So it is ok to build right? Ignore the detriment to multi-modal mobility, air pollution, toxic land uses, etc. You can’t be serious! But who knows more about what is better for the Wilmington community than calwatch right? But your community’s intransigence in denying the project, rather than working with BNSF to present compromises that could enable the project to continue while mitigating impacts for the communities affected, is basically hurting others in the region, and in the world. When these logistics jobs move from the Inland Empire to Mexico, that’s a huge economic destruction for those who live in the Inland Empire, and the residents in Mexico who have much weaker environmental standards than the ones in California. It’s like those NIMBYs in South Pasadena who opposed the Gold Line because of the train noise… but at least MTA eventually compromised with them. BNSF is absolutely correct that the communities will suffer more if SCIG is not constructed, as well as the region. The communities need to advocate for things like natural gas trucks – oh wait, BNSF has already made that commitment, although it could be sooner. The people in the community need to push BNSF for zero emission vehicles and for electrification of rail, but they also need to be aware that BNSF could take their ball and go home, the port traffic moves through the Panama Canal and to Lazaro Cardenas, and we all suffer through the effects of increased greenhouse gas emissions and lost blue collar jobs in Southern California as a result. The meeting November 7th is a Wednesday. Not Tuesday as printed at the end of this article. LA Streetsblog should print a visible correction for this important meeting.